Italy allowed two EU border agency vessels to dock on Monday allowing some 450 migrants to disembark after five other EU states agreed to take in 50 each. "Today for the first time, we can say the migrants have disembarked in Europe," the Italian prime minister's office said. Italy has complained for years that its EU counterparts have left it to its own devices as hundreds of thousands of people have turned up on its shores since 2013. 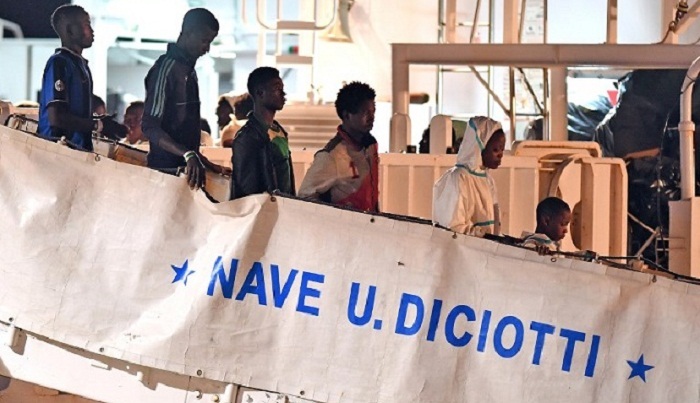 The new populist government in Rome, which came to power on June 1, has taken a much harder line on the issue, shunning its traditional role of coordinating migrant rescue missions in the Mediterranean outside of its search and rescue area. In an interview with the Catholic daily Avvenire, former coastguard chief Vittorio Alessandro, underscored the dilemma posed to his former colleagues by the policy shift. "At sea, the rule is to put rescue first, the rest comes later," he told the paper. "I share an unease with all the seamen I worked with, a great feeling of powerlessness." The ships had spent two days in Pozzallo harbour in southern Sicily following an ordeal during which they were detained in Libya. The authorities were finally given the green light to allow them to disembark late on Sunday after five EU countries -- France, Spain, Portugal, Malta and Germany -- agreed to take in 50 migrants each. At Pozzallo, several of them were evacuated to receive medical care. The International Organization for Migration (IOM) said the migrants, mostly from Eritrea and Somalia, were in a weak state, suffering from malnutrition, dehydration, scabies and abuse while in informal detention centres in Libya. They had left the Libyan port of Zouara in a wooden vessel on Wednesday, quickly running low on food and water. Early Friday, they spotted a boat, prompting around 30 of them to jump overboard to try and reach it. Four of them drowned, all Somalis, the IOM said. The youngest was 17. It is likely the boat was aware of the migrants' presence. The Italian authorities said they had spotted the boat at dawn in waters within Malta's jurisdiction for any rescue. An Italian police ship and a British ship working for the Frontex border agency finally took them on board at the weekend. The European Commission called for "sustainable" and "mutually acceptable" solutions to the migrant problem, advocating "controlled centres" in the EU where rescued migrants will be transferred before being sent to various EU states.